The Japanese archipelago (日本列島, Nihon Rettō) is a group of 6,852 islands that form the country of Japan. It extends over 3,000 km (1,900 mi) from the Sea of Okhotsk northeast to the Philippine Sea south along the northeastern coast of the Eurasia continent. It consists of islands from the Sakhalin island arc, the Northeastern Japan arc to the Ryukyu islands and the Nanpō Islands. The term Home Islands was used at the end of World War II to define the area of Japan to which its sovereignty and the constitutional rule of the Emperor would be restricted. The term is also commonly used today to distinguish the archipelago from Japan's colonies and other territories in the first half of the 20th century. The archipelago consists of 6,852 islands (here defined as land more than 100 m in circumference), of which 430 are inhabited. The four main islands, from north to south, are Hokkaido, Honshu, Shikoku, and Kyushu; Honshu is the largest and referred to as the Japanese mainland. Nanpō Islands, Izu Peninsula (part of Izu-Bonin-Mariana Arc). The Nanpō Islands administered by Tokyo Metropolis. The Ryukyu Islands administered by Kagoshima Prefecture and Okinawa Prefecture. Hokkaido – The second largest island of Japan, and the largest and northernmost prefecture, which consists of 14 subprefectures. Honshu – The largest and the most populated island of Japan, which consists of five regions. Tōhoku region consists of six prefectures. Kantō region consists of seven prefectures, including the capital of Japan which is the Tokyo Metropolis. Chūbu region consists of nine prefectures. Kansai region consists of seven prefectures. Chūgoku region consists of five prefectures. Shikoku – The smallest and the least populated island of the archipelago, which consists of four prefectures. Kyushu – The third largest island of the archipelago, which consists of eight prefectures, including the Okinawa Islands in the Ryukyu island arc. 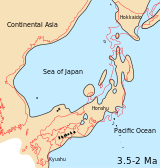 Sakhalin – Previously known and administered by the Empire of Japan as Karafuto Prefecture and a part of the Russian Federation, is sometimes considered to be geographically part of the Japanese archipelago, although Japan renounced its claim to the island in the 20th century. ^ "Water Supply in Japan". Ministry of Health, Labour and Welfare. Archived from the original (website) on January 26, 2018. Retrieved 26 September 2018. ^ Milton W. Meyer, Japan: A Concise History, 4th ed. Lanham, Maryland: Rowman & Littlefield, 2012, ISBN 9780742541184, p. 2. ^ "離島とは(島の基礎知識)". Ministry of Land, Infrastructure, Transport and Tourism. Archived from the original (website) on November 13, 2007. Retrieved 3 October 2018. ^ "Japanese Archipelago", TheFreeDictionary.com, retrieved 24 June 2013. ^ "The Chautauquan", Volume 42, p. 6. This page was last edited on 21 February 2019, at 18:17 (UTC).